Megger’s new 5 kV insulation resistance tester, available from Macey's Electrical , is designed specifically to assist the user with the testing and maintenance of high voltage electrical equipment. The case is rugged and easy to carry, being made of tough polypropylene and achieving an ingress protection rating of IP54. In addition, the model number is marked on both the top and side of the case for ease of identification in stores or vehicles. The MIT 510 5kV Insulation Resistance Tester has a large easy to read backlit LCD display making it equally suitable for use in both bright sunlight and poorly lit environments. Information displayed includes resistance, voltage, leakage current, capacitance, battery status and time constant. In addition, the elapsed time of the test is displayed constantly removing the need for separate timers. The MIT 510 5kV Insulation Resistance Tester can test when being powered by the mains or its internal rechargeable battery, a benefit when site conditions are unknown or long term testing is required. The controls of the instrument are clear and unambiguous and a quick start guide is included in the lid of the instrument removing the need to carry bulky manuals under site conditions. 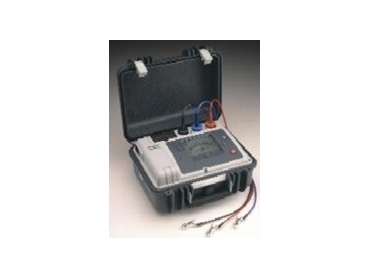 The MIT 510 5kV Insulation Resistance Tester is fitted with a guard terminal to enhance accuracy. The guard test lead is included as standard with the instrument. To further enhance the flexibility of the instrument, the MIT 510 5kV Insulation Resistance Tester has the facility to set the test voltage in steps from 250V to 5000V avoiding the expense of several insulation resistance testers to meet different application needs. The MIT 510 5kV Insulation Resistance Tester is designed to meet high safety standards and meets the requirements of EN61010. In addition, the i MIT 510 5kV Insulation Resistance Tester measures the voltage at the terminals and if this is above 50V, the instrument will display the high voltage warning and inhibit testing. At the end of the test the instrument will automatically discharge the energy transferred to the equipment during the test phase.